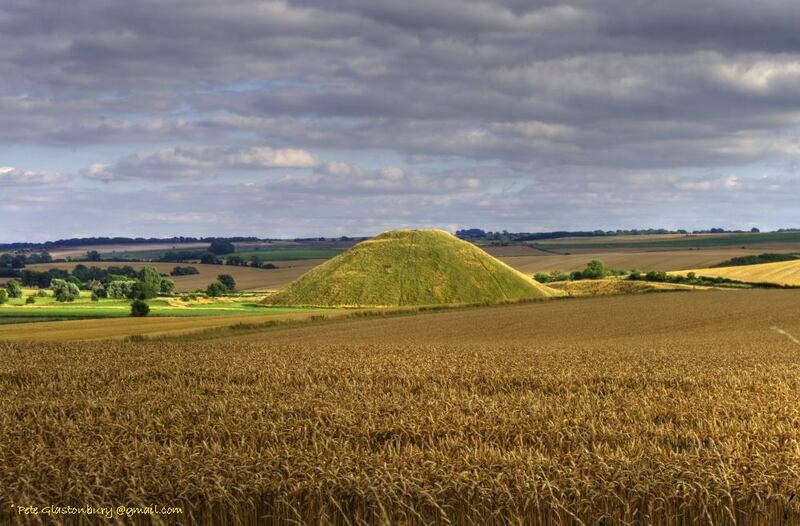 The above photograph by Pete Glastonbury is of a wheat field ready for harvest at Silbury Hill in Wiltshire. Lammas Day, 1 August, traditionally the first harvest festival of the year. Much is written elsewhere of Lammas Day and its traditions and folklore, which I do not propose to explore further here. My father’s first job on leaving school in the early 1950s was labouring on a farm near Dorchester in Dorset and I asked him this evening to share a few memories of harvest time from those times, less than 25 years after Thomas Hardy died. My father was employed as a farm labourer for the Voss family, who owned a 3000 acre farm near Dorchester in Dorset. 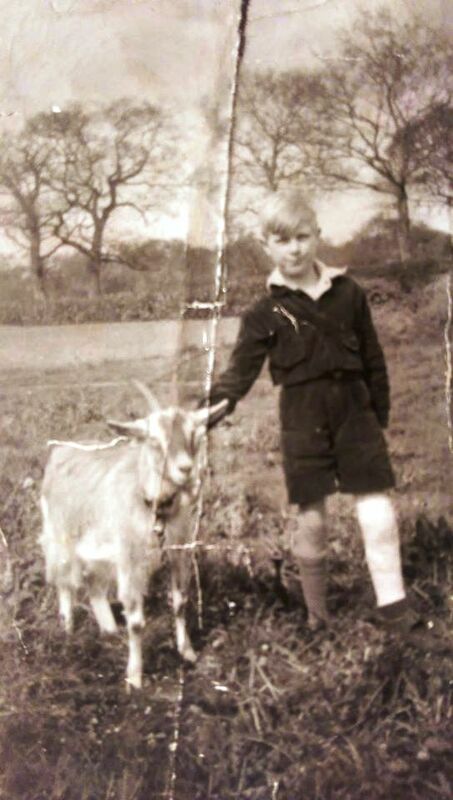 The farm was based in the village of Dewlish, where he lived with my Nan, his Stepdad and brothers and sisters. The main farmhouse where Mr. Voss and his family lived was also based in Dewlish. 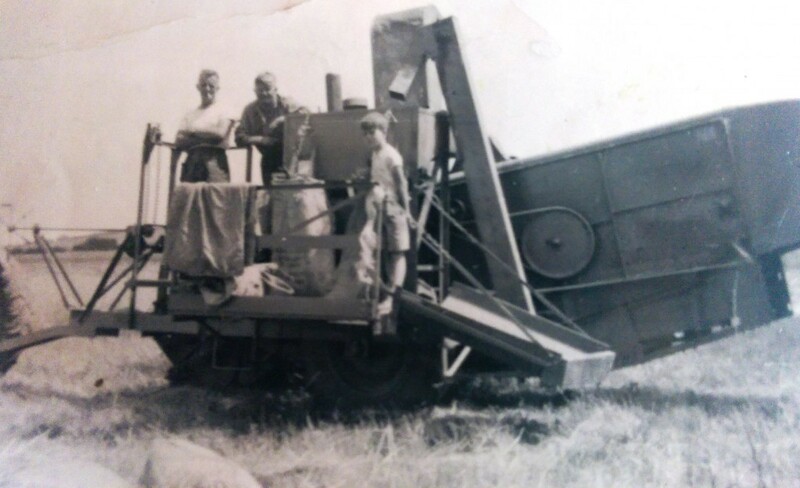 Below is a photograph of what was the latest German combine harvester at the time, with ‘Pop’ Bailey, who lived in Milbourne St Andrew and Mr. Voss’s brother and his son. Mr. Voss’s brother owned a farm too, in Devon, and was helping bring the harvest in. 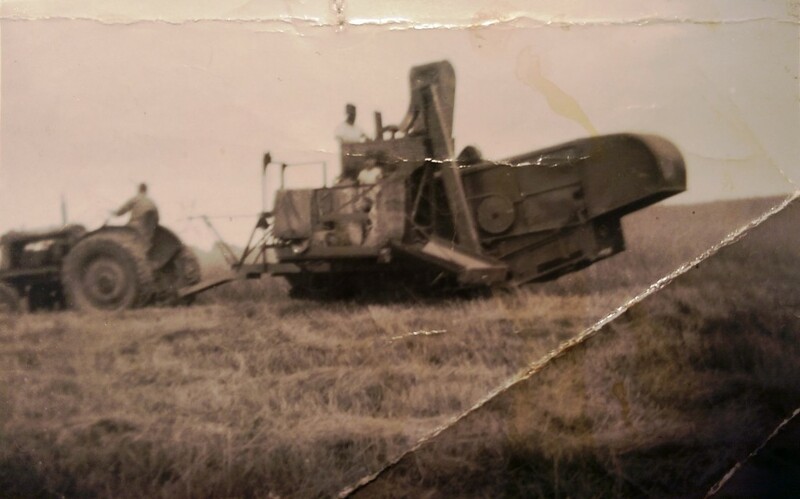 He recalls that as the combine harvester noisily edged ever closer to the centre of the field being harvested, hares, rabbits, field mice and other small animals would occasionally break cover from the central unharvested area and bolt across the stubble. An event that vividly remains in his mind to this day occurred during the second season’s harvest. At the end of a day’s harvesting my father drove the massive Fordson major tractor with a two-wheel trailer to the foot of a hill. It was loaded up with 100 weight cloth sacks of freshly harvested corn. Approximately six children who had been helping with the harvest jumped on top of the sacks of corn for a lift back to the main farmhouse, approximately two miles distant. The hill was a graduated slope in three tiers and, approaching the second tier, the tractor lost grip and began to wheelspin. The tractor, trailer, corn and children all started rolling backwards and miraculously did not veer to the left or right, staying completely straight until gravity stopped it beyond the foot of the hill. This experience was such a shock to my father that he can not recall what happened next. All was well that ended well, but with a heavy trailer laden with many children and bags of corn, the outcome could have been very different. At the end of the harvest all who had helped to reap it would share a meal at the main farmhouse in Dewlish. Thank you to Terry Kinsley for the memories and photographs and to Pete Glastonbury for his photographs. My father also worked as a barman in the long demolished Antelope Hotel (a 17th century coaching inn) in Dorchester in the 1950s, where many of the local gentleman farmers relaxed of an evening. The fear and reputation of “Hanging Judge Jefferies” and his bloody assizes held in the Oak Room at the Antelope Hotel also resounded down to my father’s generation in Dorchester, but these stories will have to wait for another day. 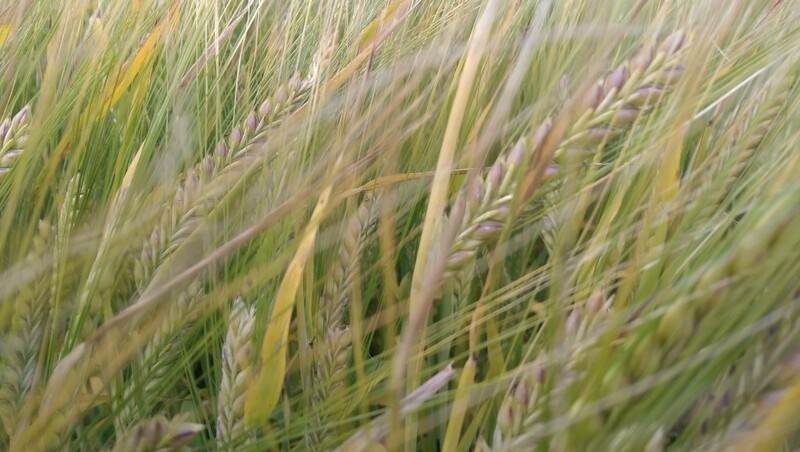 Below is a photograph Pete Glastonbury captured last week looking across a field of barley almost ripe for harvest towards Cherhill in Wiltshire. 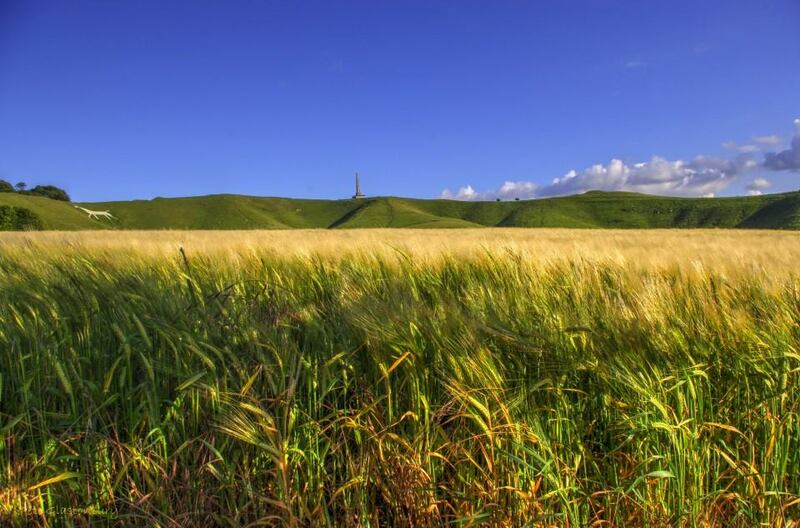 Crying the neck, corn dollies and fairy folk, customs and traditions of Lammas in Dorset and the West Country are explored here on the Dark Dorset blog.